The last few months of football here in Kansas City have been among the most entertaining I can remember. While the Chiefs didn’t advance to claim the ultimate prize in the end, this season was mostly a success, despite the pain of the recent playoff loss. The loss was largely overshadowed by the historic numbers they put up, the foundation the organization is building for long-term success and the memories the season helped create, for myself and many others. This was the season my youngest son fell in love with the sport and the team, which provided further opportunity for us to bond and create experiences we will value, and those will last far longer than the pain felt immediately after the game. Although I did my best to mentally prepare him for a loss ahead of time, he was still really upset with the result. But it was also a teachable moment for him to better understand that while success is rewarding, it’s rarely pain-free. As investors, we too were reminded of this lesson throughout a volatile 2018, especially during the painful selloff that persisted near the end of the year. There are multiple reasons why stock prices fell, including trade issues with China, rising interest rates, political uncertainty, and an overall slowdown in global growth expectations. But we understand that while the market always has something to “worry about,” stocks deliver far more long-term value and success than the brief periods of pain they bring along the way. Of course, side-stepping downturns and sitting in cash would be ideal, but it’s clear that attempts to time the market have extremely low odds of succeeding. Markets are inherently unpredictable, and timing them requires the ability (or, essentially, luck) of precisely guessing when to get out and when to get back in, consistently, over long periods of time. A costly series of steps investors often take are: (1) panic about stock prices falling, (2) move to cash after stocks have already fallen and (3) wait for the right time to get back in, typically after stock prices have already increased in value. The mistake of getting out of the market is magnified by missing out on rebounds that often follow. 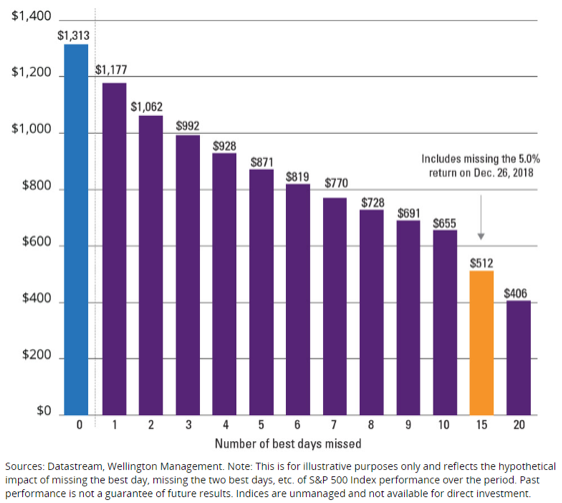 Historically, the best and worst days for market performance typically happen close together. Just last month, as stocks appeared to be in free fall, they rallied 5 percent the day after Christmas. Missing these best days in the market can significantly reduce returns over time. The chart below shows the growth of $100 invested in U.S. stocks from 1990–2018 for the entire period vs. the same period missing the best days of performance. As you can see, the negative impact of sitting out can be significant. This is not to say that downside protection isn’t important. One of the advantages of taking a diversified approach is it often reduces overall risk in a portfolio, compared to those who hold more concentrated positions. Many of our clients have exposure to segments of the market outside of U.S. stocks (bonds, international, and emerging markets stocks) and less volatile stocks within the U.S. category, all of which outperformed U.S. stocks during the last quarter’s downturn. So far in 2019, global stocks have trended upward, which often happens after periods of market weakness. We expect further volatility this year, however, as many of the issues we saw late last year remain unresolved. We are not big on making predictions here, due to the unpredictable nature of how markets behave. 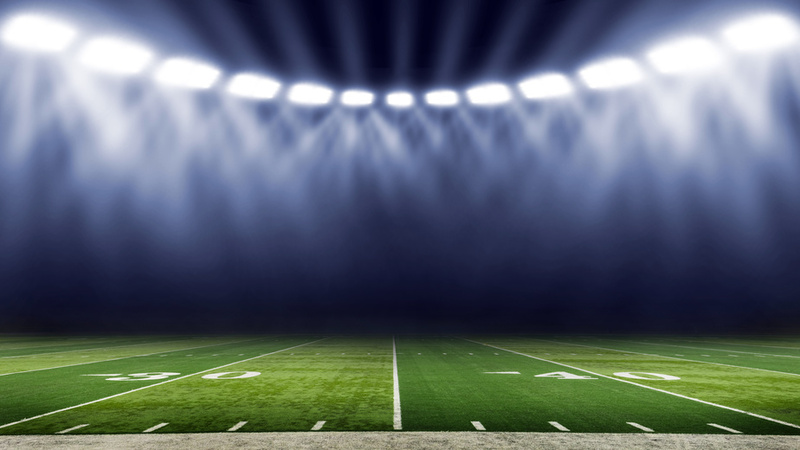 But we are confident in saying there will be more painful times ahead, just as there have always been for long-term investors (and sports fans!). But ultimately, that pain will be minimal and short-lived compared to the long-term success that patient investors are rewarded with over time. If you have any questions, we encourage you to reach out to your TRPG advisor.